All three training goals were accomplished. Felt F2 with Di2 53/39 Crankset 11-25 Cassette. 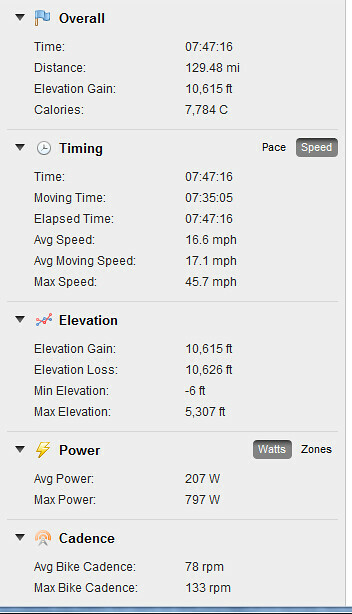 130 miles 10,000 feet of gain almost 4,900 kjs with Normalized Power of 208 watts or 3 w/kg for the 7.5 hours. I only stopped twice on the full 130 miles. The two stops were for water only– no solid foods, no nature breaks or anything else. The difference between my rolling time and total time was only 12 minutes. Below I have detailed my two stops which account for 4 minutes and 39 seconds the remaining 7 or so minutes were traffic controls. My first stop (1 minute and 5 seconds) at Bates Nut Farm (mile 47). I filled one bottle, topped off a half full bottle, downed a bottle refilled it and I was back on the bike. Total bottle count 1.5 bottles to Bates Nut Farm mile 47. I downed 1 bottle at Bates. Then 3 bottles on Palomar Mountain climb. Down 1 bottle at the top. Then 3 bottles to get home. Total bottle count 9.5 24 oz bottles! I had a good day on the bike. My legs felt strong throughout most of the day. I faded a little on Palomar Mountain but only near the top. One reason might be that I didn’t stop at the store at the base of Palomar to refuel. I had made my refueling stop 8 miles prior at Bates Nut Farm. I rode hard from Bates through Rincon and attacked the climb just when the road kicks up by Harrah’s Casino (lowest elevation point of the climb). Starting the climb in earnest from just past Harrah’s adds one more mile to the already long 11.6 mile climb. This extra mile makes it a 12.7 mile climb 4200 feet of gain AND is in the steepest section (lower half) which can really put the hurt on you …but that’s why I’m out there right? Notice the grey line (torque) in the above chart going way above the yellow line (power). I was riding an 11-25 cassette today. In this case the torque line is an indicator of how steep Cole Grade is in certain sections. Cole Grade was featured in the Tour of California on the final stage which also included Palomar Mountain. Palomar Mountain is slotted in as 9th on John Summerson’s list of the California’s 10 toughest climbs. All for now…please pass my blog on to your friends. 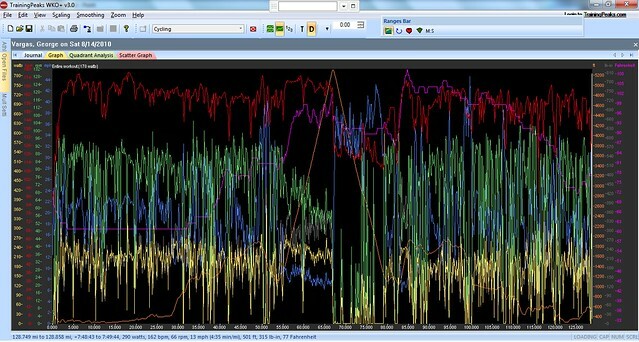 This entry was posted in climbing, Furnace Creek 508, Palomar Mountain by REV Cycling Directeur Sportif. Bookmark the permalink. Thanks for the post. 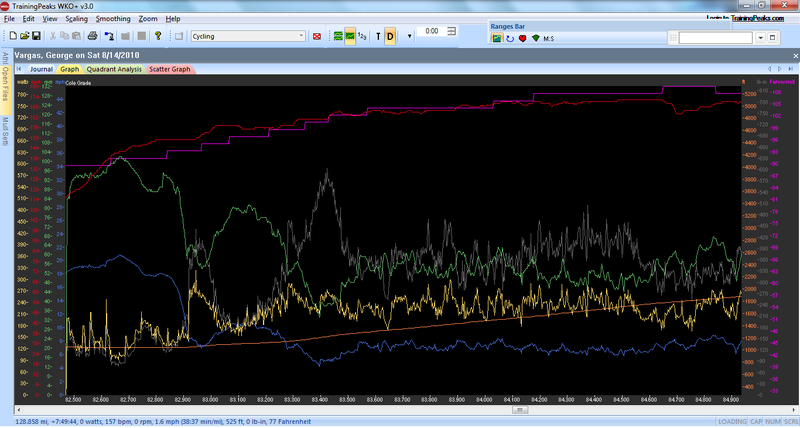 Hard ride with elevation gains and temps that kill off most folks. I am curious about couple of things. What is your day to day diet look like, what do you do for stretching and core strength? I think there gems in that information if you feel comfortable sharing. First off let me thank you for reading my blog. I also want to thank you for taking not only the time to read it but the extra effort to make a comment. Thank you. I would be glad to share some “gems” with you and everyone else who might be interested. OK here goes. Diet- I’m not that particular and maybe I should be about what I eat. Yesterday’s ride was 4,900 kjs. In laymen’s terms that is 4,900 calories or almost 5,000 calories. I don’t know my BMR but on the conservative side let’s say it is 2,000 calories. That means that yesterday’s calorie burn was about 7,000 calories. So with that much calorie burn I j eat anything I can get my hands on. I eat sandwiches, pasta, rice, salads and fruits and vegetables. Obviously, I stay away from unhealthy things most of the times but from time to time I give in to cravings such as real Cokes, pizza and Ice Cream at midnight and so on. I gotta live too right? Stretching- I don’t do any stretching not before nor after my rides. I can barely touch my ankles but I can get in a very aero position and ride for hours. Maybe when I get older I might require more stretching to stay limber and injury free. I have been fortunate until now that I haven’t had any injuries from riding– only crashes. I am only 45 years old and still feel like a 20 years old kid. I urge my clients to stretch but I don’t have a regular program that I follow. Core strength– I don’t do much of that either. I abhor sit-ups, crunches and every variation of them. I love push-ups must be the former Marine Drill Instructor in me 😉 I have a strong core. In fact, I can hold myself with my core when I’m in the drops and take my hands off the drops but I am still bent over the bars. Probably hard to envision that so maybe I’ll shoot some video of it. Any other questions please feel free to send them my way. Very interesting that you have no injuries at such a young age of 45. You will be thankful in the long run for that. I like to ride with music because it helps motivate me while I am climbing. Is music something that you use while riding? if so what do you listen to? I always wonder what other riders are listing to. I have to say that you are in bikers heaven where you live. Everything is in riding distance. I have spent many miles climbing over off of Santiago Canyon Road, Modjeska and Live Oak Canyon to name a few. I like to feed my body with Sustained Energy, I have not tried Infinit Nutrition powder, why does this work so well for you? How can you ride so many miles and not feel like towards the end your body is calling for solid food? I have been successful with my doubles to stick to Sustained Energy but around 175 I get bored with it and then I feel like solid food is needed. I really enjoy reading you blogs, please keep blogging. You have much to share and I appreciate that you do. Because you are so kind to share I now have new ride sheet and I get to expand my riding list. Thank you for reading my blog. Getting lost in my blog? Well I have a lot going on in them so that’s understandable. There are well over 400 posts…how much time to you wish to spend on my blog? What I meant by no injuries at my age is that I have done some ridiculous amount of miles in a short amount of time. I don’t worry to much about the things that people obsess about such as…cleat placement, float on their pedals, saddle placement, type of saddle and so on. Some people worry too much about the silliest things instead of just riding their bikes and suffering to improve. 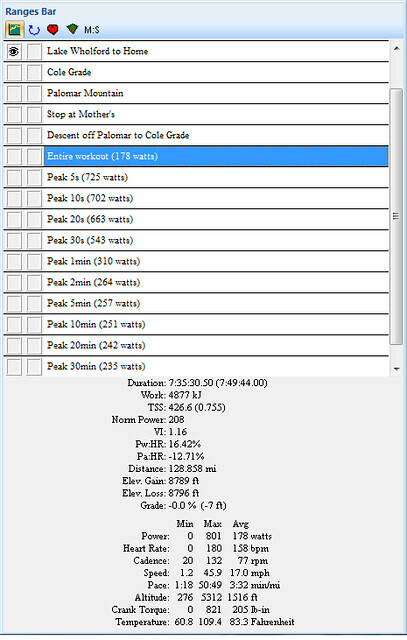 I have ridden fixed cleats, different length cranks (from 167.5mm to 175mm) on different bikes, different saddles and different saddle heights. The problem with most people that don’t improve year over year is that they don’t want to suffer! Furthermore, I dare say that if you are not training with a power meter how can you really tell me that you are really training effectively. 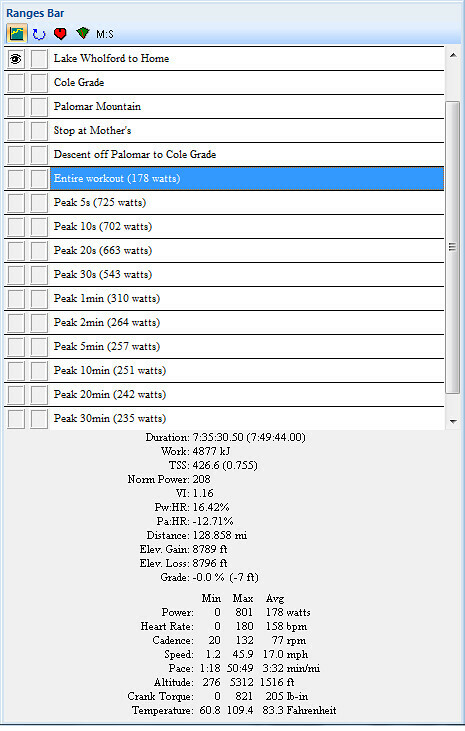 Lights- no one has enough burn time AND brightness to last multi-day unsupported events. But I digress, I listen primarily to techno. I don’t want to think about the music or the lyrics or anything it’s just on as filler. Sometimes songs go by and I realize I have been “in the zone” for the last 1/2 hour and missed a bunch of songs. I also wonder what other people listen to. On the tandem I use a a splitter so my stoker and I are listening to the same music as we climb a mountain or descend a mountain at 60+ mph. San Diego is cyclist paradise. Orange County is not. I have found it leaving much to be desired. I have to drive to Glendora, Duarte, Redlands or La Canada to get good climbing in. Santiago Canyon, Modjeska and Live Oak are ok. But they are way too busy with traffic and they are NOT real climbs. Unfortunately, that’s all I have so I ride them and am thankful that I can make a ride of it and still be back at work to open the shop by 10am. Maybe one day we can go up Silverado Canyon and continue up Maple Springs Road. It is one of the little known and best kept secret roads with great climbing. Sustained Energy is good as are most of the Hammer products. Infinit Nutrition is a customizable nutrition product. If you go to the link provided you will see that you can work the sliders to get more or less of each of the categories. The product is not nearly as “heavy” as SE or Perp. At events, like supported Double Centuries, I will use the Hammer products but for my own training and racing there are better alternatives for me. Hey George! Don’t know if you remember me, but we met awhile back while climbing Palomar. It was good to see you on the mountain this weekend, (I was the rider on the Bailey bike near the summit). Also the same person who asked you about your gearing choice for the climbs in the Sierras. I plan on racing the Death Valley Stage Race this October, and having never particiapted in any events like that, had some questions, and have been doing as much research as possible, so I’m as prepared as possible. Keep up the good work, and let’s get out sometime and hit the hills! Thank you for reading my blog and for making a comment. Knowing what your training regime consists of, I figured you had quite a few miles in your legs when I reached you! I’ve been putting in some solid training, consisting of as much climbing as possible to get ready for Charleston and the DV Stage Race. Let me know whenevr you need a training partner on the climbs. I share your love for the hills. As much as I love to ride, if it wasn’t for climbing, I’d probably find another sport! You’re doing Mt Charleston? I’ve always wondered about that race. When is it? Come back and tell me how it went for you. DV stage race should be good too. If you like to climb you should check out Everest Challenge. I usually do it as the last hard training weekend before the Furnace Creek 508. I agree with you 100% if I’m not climbing then it’s worth riding. Take care and good luck in your races. 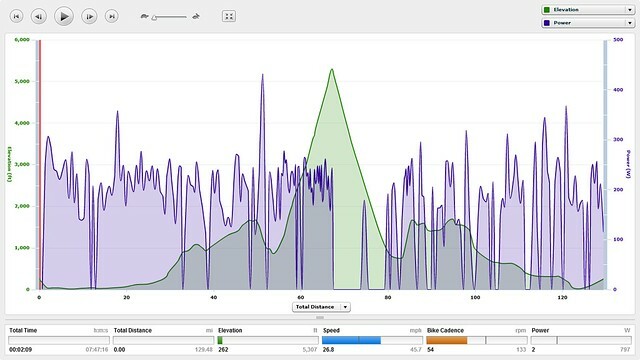 So what gearing are you using when you do a climb like Palomar? (Apologies in case you covered this in an earlier blog but I’m just staring to follow yours.) One reason for asking is that I ride a standard 53/39 with a 12-25 cassette and am wondering if it’s a realistic goal to use it on a climb like Palomar. Welcome to my blog. Thank you for reading and asking questions. It’s the very reason I created this blog– to help, to learn and to share with riders globally. How did you find the blog? What do you like or wish there was more of? Also what do you wish to glean from my blog? 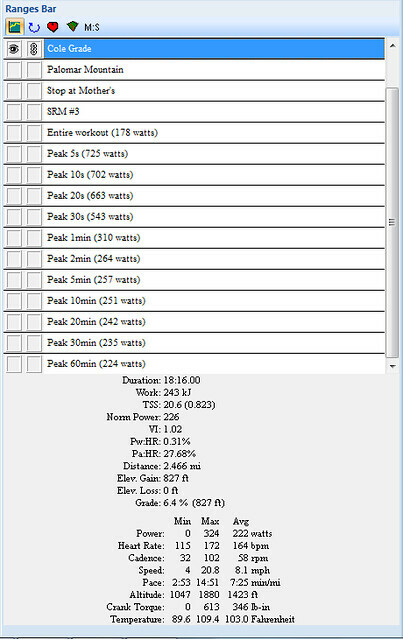 Alright let’s talk gearing. For the average rider I think a 53/39 and a 25T cog will be a challenge. The lower slopes of Palomar Mountain are consistently in the 8-9% range. If your cadence falls below 75 RPM I suggest you should be in a larger cog. I don’t recommend “grinding it out” for the sake of grinding it out. After you get past the lower slopes and get some respite on the flat section, you still have 7 more miles that average 7%. I would recommend a 27T or 28T that both Shimano and SRAM provide. It’s better to have it and not need it then need it and not have it! To be frank it is difficult to provide advice when knowing so little about you. For example, your climbing experience, your weight, your fitness, your goals and so on. My comment above is general in nature. George – I think your advice is good. Ive climbed Palomar in a 39/26 and most recently a 39/28 for the first time. It was nice having the 28 bail out and honestly made it easier on the knees. Also with the 28, Cole was a little less intimidating and tackled that too. I dont think I would have attempted with a 26 up Cole. So maybe I was a little slower in the steep sections, but I ended up getting more altitude, miles and more interesting ride with the 28. Ill be putting the 28 back on for my next Palomar journey this weekend. George – your an animal. I havent been on your blog in a month and there is a ton of content on here. Too bad you cant blog and ride at the same time. Youd probably gain a few hours a day! I’m going to experiment riding an 11-28 on Palomar this Saturday. I want to see my cadence in the mid to high 80’s through the orange groves — the steepest sections of the Palomar Mountain climb. What day are you going? Thank you for noticing the content on my blog. My blog is designed to be interactive with my readers. If there is anything you would like to read about feel free to ask for it. Ill be hitting palomar saturday. Ill start at 7 am in escondido and do wohlford, palomar and cole loop. Ill be looking for you. Ill be the big guy on a Motobecane Ti. I forgot how bad the orange groves are. At last south grade has switchbacks that are interesting. The orange groves are boring and steep and at the beginning that busts the morale. Training for the white mountain double on 9/11. Thanks for posting info on bristlecone back in June. It looks to be a mix of hot cold – and hopefully no rain! It will be my third double this fall – finally a triple crown finisher for the first time. Thanks for the added motivation.